Good afternoon, I just wanted to give you a piece of my mind! Scott Francis Construction is without a doubt “a one stop shop for your construction needs” I needed a number of things done in my home in order to put on the market, and sell for “top dollar”. Scott came in and had great ideas and saw my very vision to a “T” everything was done in a matter of a week. I would recommend Scott to anyone that wants a new bathroom kitchen etc, Amazing work to say the least. I must say that the work your company did was so above everyone else that I have come in counter with. I could have chosen ALL the attributes listed to describe Scott. We tried a couple different contractors over the years to do some upgrades to our home, but it wasn’t until we found Scott that we finally realized how AWESOME the work could actually be done. One of the first projects we hired Scott for was a master bath remodel. It wasn’t just done to our liking; it FAR surpassed that and is AMAZING! It is simply so much more than we ever could have hoped for and VERY reasonably priced. I recommend Scott for ANY work you need to have done. I assure you that you will be equally pleased. Scott was our GC for a house expansion. The house square footage was doubled and a large multi-car garage / office were added to the acre lot in 2007. The expansion to the house included a complete rebuild of the kitchen area, a new master bedroom suite and alcove, an entertainment area and laundry room. The office / garage area was designed to support not only the multi-car garage, but an office with expanded electrical needs to support a computer repair shop. As the GC, Scott was involved in the design phase along with the actual build out. He guided us with suggestions as needed and responding quickly to our questions. During the construction phase, he was responsive to our needs and made a few last minute changes at our request. While getting the initial project up and completed on time and on budget is a major evaluation concern, Scott also provided the important third component of customer service after the project. As with all new construction projects, minor touch up issues are required a few months down the road. Scott provided the customer service in a manner that rates him a 5 star rating in our book. Quick, efficient and going the extra mile was his standard support method. Should we need future construction needs, Scott will be the only one we will use. In summary, Scott provided a high level quality product and strong customer service that is a rarity in any business. On January 30, 2002 we agreed and signed a contract to start three different projects of various complexities. On February 27, 2002, the three projects had all been completed. Given normal “downtime” at the start and between each project, the total number of days amounted to 28 days from start to finish. Wonderful. The roofer and a carpenter repaired a damaged beam next to the gutter The gutter was replaced and extended to include a second downspout to eliminate water leaks in the middle of the gutter. The painters were equal to my task and even exceeded our expectations in their friendly style, openness to suggest ideas for the future, and a total commitment to quality. For brevity of this letter only, I did not discuss the demolition, blocking and stucco work which were, again, at high standards of craftsmanship. Scott, in short, if all projects were completed on time, budget, and quality as yours, complaints would not exist. Extremely professional. Very reasonable quote and delivered exactly what was requested within the budget. Midstream project changes are also supported very well. Full city inspected construction. We would like to thank, once again, Scotts Francis Construction for the fantastic job they did on our bathrooms and kitchen remodel. We had four bathrooms and our kitchen remodeled and we could not be more pleased. This was a challenging job that was time constrained as we moved out of one house into another. Scott listened to our needs and performed as he said he would. He and his team completed the project before the moving van showed up and it looks beautiful!! We would not hesitate to use Scott and his team for any of our remodeling needs. I had a small house on a large lot with a big Family. I needed to double the size of my home ASAP. I had money saved for the project and was very concerned about going over budget. I was specifically worried about the project going over budget due to lack of planning or foresight by a contractor and me having to take out a loan to complete the project as a result. After interviewing several contractors, I finally chose to go with Scott Francis. There was a lot of apprehension on my part since I had zero experience. That obviously was NOT the case for Scott. I had so many questions… He answered them all to my satisfaction. His overwhelming experience and portfolio put me at ease. It can be a scary experience finding someone you can trust with your money, your home and the quality of work they’ve performed after your money is gone. Some of the contractors I interviewed before Scott gave me such a bad vibe. They tell you everything you want to hear, but can you trust what they say? I’m not the only person who will tell you- With Scott, that’s not the case. There was not one single time during the build that I couldn’t reach him by phone or text. He was physically present- on the job site most of the time during the build. Scott masterfully converted my home from a 3 Bedroom-2Bath to 5 Bedroom-3Bath plus an oversized brand new 2 car garage. As well as a complete remodel of the existing portion. Which included: Relocation of the master bed/bathroom, new pantry, existing bath remodel, complete existing kitchen remodel, new tile throughout the entire home, raising the height of existing hallway, the list goes on… Scott has an amazing “Can do” attitude, which turned out to be invaluable… When Maricopa County presented obstacles, he presented solutions. I truly believe that the build would’ve fallen thru at a couple of points if I hadn’t chose Scott Francis for the job. Thank you Scott. My husband and I hired Scott Francis Construction to remodel our master and guest bathrooms in December of 2012. When Scott came to our home for our estimate he was timely, polite and professional. He was extremely helpful by listening to our ideas and incorporating the logistics of the project to create bathrooms that were just what we wanted. Scott was very accommodating with our schedules and was able to complete our bathroom remodeling on schedule and within budget. We love our bathrooms and plan to do a few more projects to update our home. We will certainly be contacting Scott again and highly recommend his company. We hired Scott Francis to remodel our kitchen after getting bids from several contractors. We ultimately hired Scott because we felt the most comfortable with him. Scott was knowledgeable, honest, and made suggestions based on his expertise. They remodeled our galley kitchen, opening it up to the rest of the home. They also created a laundry room that we didn’t have before and updated our powder room. We lived in our home during the remodel and most days our dog was home with them. Scott and his team were trustworthy and mindful of keeping the house as clean & livable as possible for us during this time. They were at our home working every day and completed our job in the timeframe given. We love our new kitchen and we’re looking forward to having Scott and his team back to remodel our bathrooms in the near future! I had Scott Francis Construction add a patio cover addition on to our existing cover approx. 30ft. in length. Scott came out and got measurements, had a proposal in less than 72 hours that was very affordable. He was there when he said he would be, did exactly what I asked, and completed the project in less than a week! He had roofers and stucco guys that did a fantastic job as well! We did have a small issue but it was taken care of right away. I am very particular about things I have done and I would recommend Scott Francis Construction to anyone. Thanks Scott! Okay, so there is this old cranberry fruit juice commercial that played in the 90s and it’s premise was that “life is sweet”, not tart if you drink their juice. To examplify something in life that was “tart”, they chose to show this couple talking to their general contractor about renovating their house. We renovated our entire house from the studs up and I’m here to tell you that if you choose Scott as your GC, he will get the job done as budgeted, will get it done in the time frame quoted, and will never disappear and leave you hanging. I can’t say if you’ll want to kiss him full on the lips, but you sure will want to give him a big hug. Let your life be sweet, not tart… go with Scott. My wife, Susanne, and I were very pleased with the work that you did. We feel that you did a terrific job in creating our patio. We especially loved the wood look under the roof. It not only looks better than the drywall that most people use:> but we know it will last longer. In addition, we have received a lot of compliments on the look of our patio. It just shows that yon truly care about the quality of your work, and its appearance. Thank you for a terrific job. We will be recommending you to all of our friends. I am writing this as a reference for Scott’s work on remodeling my master bathroom. We had four contractors come bid the project. We quickly narrowed it down to Scott and a larger contractor right away. The large contractor had a fancy computer program that showed us what it would look like completed. This was very enticing as you could see your vision for your remodel. However, the price was about 40% more. When Scott walked through the scope of the project with us, we were really impressed with his attention to detail. We also realized that Scott does a great deal of the work himself. This gave us great confidence that the project would be done correctly to our specifications and that he wasn’t just a salesman (like the large contractor). We opted to go with Scott and we couldn’t have been happier. The timeframe with the large contractor was five weeks before they could start and four weeks to complete. Scott conservatively estimated two weeks to start and four to complete. The project actually began only a week later and all the work was done in three weeks. Every time we had a question, Scott came to the house to talk us through what was going on. He and his subs spent a great deal of time walking us through our vision as well as what colors work together and what don’t. As we expected, his attention to detail was perfect and every little thing we asked for was completed to our liking. The project came out exactly as planned and exactly as quoted. We were extremely happy with Scott’s work and have referred him to other friends since. Thank you Scott for making our dream bathroom a reality! In early 2013, I selected Scott Francis Construction to build out my entire interior store at Glen’s Frozen Custard in Tempe. This included tearing out the prior build out building out a new design. I can’t say enough good things about the way Scott runs his company. He showed up each and every day and completed my entire project in 5 weeks as promised and on budget. This is something that left an impression upon me because of how irresponsible some contractors can be, compare to Scott’s high level of customer service and following through on his promise to get the job done on time and on budget. I truly was treated as though I was his only customer even though I could hear him take calls from many other jobs that were ongoing at the same time as my project. I would highly recommend Scott Francis Construction for any job large or small. We are writing this letter to communicate how much we appreciate Scott Francis for his outstanding work. In March I had the pleasure of meeting Scott and asked him if he did small bathroom jobs and/or even had the time to look at what we had wanted done. In a matter of a couple of days, Scott was at our home and went over how he could help us replace our original shower enclosure and door. He gave us some great advice and immediately showed us some pictures of other bathroom projects. His communication was impeccable. Within a week he had everything scheduled; the demolition, the prep work, then the actual renovating! Always after every step, Scott called and made sure we were pleased with the progress. We were elated with our new custom shower! We would highly recommend Scott Francis for any job. His professionalism, creativity, and sincere kindness were carried out from beginning to end. We would highly recommend Scott Francis for any job! My wife and I had lived in our home for 27 years and were in need of some major remodeling. We talked to a friend who had used Scott Francis Construction and they invited us to come look at their home. After doing so, we contacted Scott, we told him what we wanted to do, and the project moved forward. My wife and I were immediately impressed with Scott. He listened to what we he had to say, made suggestions when we needed them, communicated with us throughout the project and was very hands-on. We also liked the fact he drove us himself to go pick out things such as our tile flooring, granite countertops, kitchen appliances, plumbing fixtures, and our lighting fixtures. He made several trips with me throughout the process to help me with purchases, when needed. Scott gave us a very competitive bid and stuck to it. We chose to upgrade a few things after the contract had been signed, and the charges were very reasonable. As you can expect from any job this size, not everything went perfectly on the first go round. We were again impressed that Scott and his team listened to what we needed fixing and he didn’t stop until everything was completed to our satisfaction! My wife and I highly recommend Scott to anyone who is in need of a very honest contractor! We just wanted to send a letter of gratitude for the unbelievably positive experience we have had with you and your team building our-home. Trying to build a first home is stressful enough, not to mention we were building this first home while still living in New Jersey. I have never had such quick responses to every single phone call I have made to you during the short 5 months it took to build our home!!!! We really appreciate all of the precision, attention, expertise and detail you and your sub­ contractors put into our home. I especially found it comforting when you would call to let us know if something on our plans didn’t look right, and you had a better suggestion, which every time, turned out perfectly in our opinion. You went the extra mile in every detail, and still managed to keep us below our budget number! Not many builders can accomplish that. We are extremely pleased with the final outcome, and are happy to be in our new beautiful home. Thank you again for everything you have done for us and for always looking out for our best interest! I wanted to take this opportunity to let you know how pleased we were with the deck and patio covering you built for us. The quality is wonderful but the professionalism and efficiency of you and your workers impressed us. You kept us informed every step of the way and completed the job exactly when you said you would. Thanks again for making our deck addition truly enjoyable and a memorable experience. I have had the opportunity to hire Scott Francis Construction on two separate occasions, both involving large water damage claims to different sections of my home. From the onset, it was obvious that Scott had an enormous amount of experience not only in construction, but also in the insurance claims process. Scott coordinated meetings with the insurance adjuster to review the damage estimate to ensure nothing was missing. Scott’s crew was always on time, very professional, and able to answer any questions I had during the process. Scott made sure the job was done right and no corners were cut in doing so. Scott is a person of high ethical standards, which is the reason I have used him twice and recommended him to my family and friends. 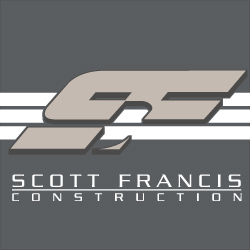 This letter is intended to serve as a sincere thank you to Scott personally and a sound recommendation for a job well done by Scott Francis Construction. From the start we felt very comfortable with the whole process. The quote he submitted was inclusive with a few changes we added to our original plan. Scott was very helpful in guiding us from a rough idea for our covered patio to the finished product we are very happy with and proud to show off. In the past, I had done very similar work for many years and can attest to Scott’s construction knowledge. His attention to detail made our project appealing, sound and professional. He was able to make our patio and cover flow very naturally with the existing structure, the bay window and the back of the house. It doesn’t look at all like an “add on”, after the fact, patio. The fact that Scott is owner, operator and a hands on construction worker, I think, allows him the ability to understand what it takes to get the job done at a fair price and stay within our budget. We are very happy we didn’t pay the high price some of the others were asking. The sub contractors he used were also very professional and stayed on schedule as promised. Francis Construction for any project he says he can complete. We are looking forward to a working relationship with Scott for years to come on other projects. For the past few years my wife and I had considered remodeling our kitchen and laundry room. We would always take notice of what some of our friends and family had in their homes and talk about what we might do if we to remodel our house, incorporating some of the things we liked. It never seemed like the right time considering everything that was going on with life and our two kids. We would talk to contractors and people that had done similar projects and the answer was always the same, be prepared to live without a kitchen for at least 3-4 months, some contractors even told us that we would need to move out of our house to complete the renovations. That caused us great concern, as this was going to be a huge investment for both our family life and our wallet. Moving out for months and even eating out constantly would surely put a dent in our budget and what we could afford to do, and so we waited and waited for the right time to remodel that never seemed to come. Along came Scott Francis…….. We had first noticed that a good friend of ours had hired Scott add some square footage to their house. When we asked about their experience they raved about it, said that he did high quality work, ran a tight schedule and delivered their exact vision. That all sounded great, but my wife and are not interior designers and had a basic idea of what we wanted to do, but we were certainly not visionaries when it came to remodeling our kitchen. We needed help, but without hiring and architect and an interior designer for lots of $$$$$ and not knowing if we could afford to do the remodel sounded pointless, so again we waited. About 6 months later, another one of our friends used Scott to remodel their kitchen, we watched anxiously as they went through the process and were amazed how quickly Scott’s team was completing work and how clean Scott’s team left the job site every day. They were doing all this while our friends still lived in the house, and from start to finish it seemed like the job took only 4-6 weeks. When were walking through finished remodeled kitchen and laundry room, we were noticing some really cool features and asked about the layout. Their response consistently was one of two things, “We talked to Scott about our ideas and he worked with us to bring them to life” or “Scott suggested it, isn’t that cool, we would have never thought of doing it that way, but we love it.” As Brook and I left their house that day we decided to give Scott a call. From the first time we met Scott he made us feel comfortable, truly listening to our ideas, talking about our schedule and offering suggestions all without being overbearing. He helped us with come up with ideas, advised us on where we could get the most for our budget, all while helping us design together a beautiful space that would meet our families needs. We decided to completely remodel our kitchen, laundry room and family room. We tore down walls, moved plumbing, relocated HVAC and appliances, installed all new cabinetry and lighting, and don’t forget the floors, this was not a small job. When we asked about schedule to the work he estimated 5-6 weeks, based on the conversations we had with other contractors we expected it to last 8-10 weeks, so we were shocked to hear that short of a time frame, but happily accepted it. The quoting process was easy and simple; he answered all of our questions and even advised us on where we could get the best discounts on appliances and other accessories. We saved over $4000 by using his contacts, which helped us add those last few features (that we never knew could exist) when we started the project. While we went through the process, Scott was always there to help us make design choices and improve on our original plan. As we knew was inevitable, there were those moments when unexpected situations came up doing a project of this size. Scott always explained what the situation was, explained the process to fix the issue, and completed the work in a simple manner, which made us feel at ease. As any homeowner we were very particular with where we wanted canned lighting placed, doors located, new walls placed, and the overall design. At one point some lights and a door were installed in the wrong spots and when they realized the mistake, Scott and his crew immediately redid the work to our desires and never once complained or asked us to pay for the extra labor. We lived in the house while the project was being completed; his crew was very respectful of our home and left the job-site after cleaning up every day. We were totally comfortable with them in our home, even thought we would leave for work every day and have them in the house unattended. All of the subs Scott used, from plumbing to drywall, painting, flooring, tile work, cabinetry, etc, were just as respectful as him employees. I would often ask the subs about other GC’s that they did work for and how they compared to Scott, and time and time again they said if they were to remodel their own house they would use Scott. They said he drove them hard, held them accountable for the quality of their work but was very fair and honest in their business dealings with him, and had recommended Scott to their friends and family. Scott treated us with respect and honesty throughout the project, the end result was amazing and came out even better than we could have hoped. In the end, we were extremely satisfied. Brook and I asked ourselves why we waited so long when this could have been done years ago. The answer is quite simple; it took us that long to find Scott Francis Construction, and we are glad we waited. And about the timeline, it took Scott just 2 weeks before the kitchen was usable and 4 ½ weeks to completion, which worked out great for us!!!!! Scott Francis was recommended to us by a friend. Scott and Matt (Desert Peak Cabinets) came out together to do the estimate. They were cordial and professional but most of all quick and were respectful of our time. Scott had design ideas we had not considered. His bid was fair relative to the others we received. Scott Francis’ contractors remodeled the master bath, kitchen and guest bathroom. All the workers were friendly and respected our house, cleaning up at the end of each day. They were all conscientious. Matt Creaney’s custom cabinets are wonderful. Aaron Fast (Lifetime Plumbing) was an excellent plumber as well. Scott was easy to get a hold of and very responsive to questions. Best of all he stayed on schedule. There were issues that arose, as with any remodel, but Scott was always ready with a solution and stayed positive throughout the process. We appreciated his attitude and would recommend and rehire him and his company. I would just like to say thank you for a job well done. Vmce and I are truly impressed by your ability to design and create exactly what we wanted; even when we were not able to communicate what it was we wanted. The final product is awesome. I hope you agree. Each member of my family has come by to see the work and it is unanimous. “What a beautiful job”! You may not be aware, so I would like to let you know a few important things about those you had work on our home. First of all, your crew always showed up on time. Sometimes, they even showed up on Saturdays and Sundays just to make sure the job was running on schedule. Second, they always cleaned up after themselves, and that was also impressive. And last but not least, each individual that worked on this remodel was a professional in every sense of the word. They were on time, clean, courteous, helpful, and informative. I would enjoy working with them again. I can’t explain how much you have restored my faith in large home improvements. I will call on you again in the future for any and all of my construction needs. I wish you much success. With your excellent quotes and supreme work ethic, I know you ‘II be successful. Good luck to you and thanks for all you’ve done. I have enclosed some photo’s you may show to your potential clients. Feel free to provide them with my phone number so I may serve as a reference. Scott would love to hear from you. Please submit a testimonial on a job Scott Francis Construction completed for you! Thank you for your time.